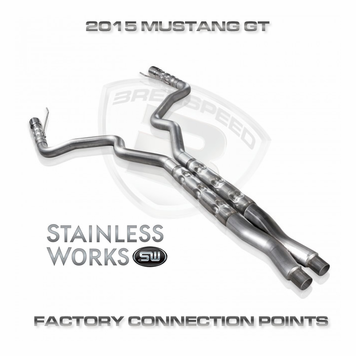 Stainless Works 2015 Mustang GT 5.0L 3" Catback Dual Exhaust with X-pipe, retro chambered mufflers and mirror polished 304 SS slash cut conical double wall tips. Includes hangers and clamps and mates to the factory connection point. 304 Stainless Steel.